Potassium is integral to health and has many roles in our bods! It plays an integral role in electrolyte regulation, breaking down carbohydrates, nerve function, maintaining the acid-base balance in the body and generally keeping our cells healthy. Importantly, sodium and potassium work together to regulate water and mineral balance through the body. To top it off, the heart’s ability to maintain a regular rhythm is largely thanks to potassium! It is an important little sucker, and an essential mineral. Potassium is the ‘Yin’ to Sodium’s ‘Yang’, in that the balance of these two nutrients in the cells is essential for maintaining water and mineral balance in the cells. Back in the day, we used to eat a diet higher in potassium than sodium, but with the emergence of processed food in the 60’s, the equilibrium was put way out of whack. We now consume a diet much higher in sodium than potassium and this has been linked with an increased risk of death due to cardiovascular disease. 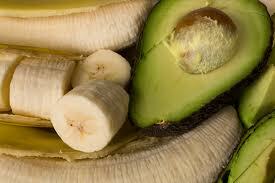 Research suggests that a diet rich in potassium has protective effects against hypertension, osteoporosis and stroke. Just to clarify, the potassium rich-low sodium diet was not really harmful, as you’d have to eat ALOT of fresh food to have too much potassium (unless you have kidney disease, see notes below), but when the pendulum swings the other way, the results ain’t good. We eat sodium in such concentrated amounts that it is pretty easy for the balance to move toward high ‘sodium-potassium poor’ with the undesirable health outcomes outlined above. Potassium is found in fresh food, bananas are the most common food source associated with potassium. Other fresh food sources include avocado, dark leafy greens like spinach, apricots (dried apricots actually have more potassium than fresh ones, oddly enough) as well as soy beans, baked potatoes (sweet potato with the skin is also good for those who are anti-white potato or diabetic), fresh salmon and mushrooms. I should mention that people with kidney disease need to be very careful how much potassium they consume, as they are at risk of developing hyperkalemia (high potassium in the blood). Healthy kidneys remove excess potassium in the urine to maintain normal levels in the blood, however people with kidney disease have compromised kidney function and therefore may experience a build up in the blood. This has nasty consequences such as nausea, weakness, numbness and even heart failure. A Dietitian will be able to formulate a specific diet to help anyone with kidney disease maintain their health through their diet. For the rest of us, GO P-O-T-A-S-S-I-U-M! This entry was tagged cardiovascular disease, hypertension, kidney disease, potassium. Bookmark the permalink. ← Make Friends with Plants for a Healthy Heart, and more!